Total amount RM 106 inclusive 6% GST (Goods and Service Tax) are applicable for all above mention package Tax Invoice will issued by ONI Network Sdn Bhd. 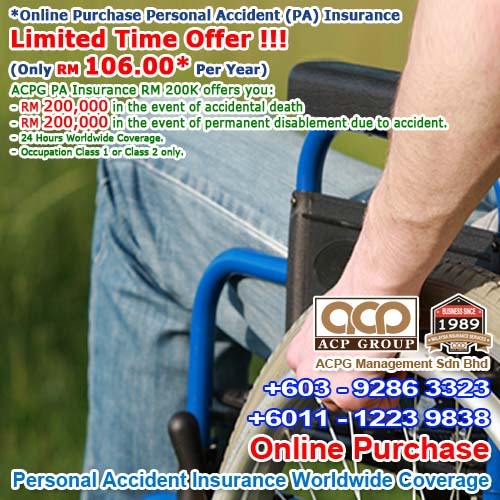 Pays a cash sum up to RM 200,000 in the event of permanent disablement due to accident. 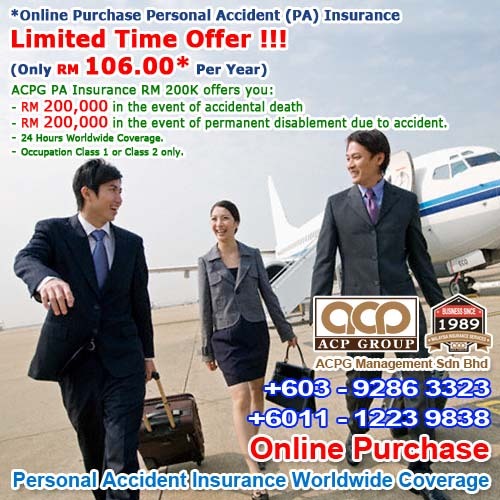 ACPG 200K is available to individuals Malaysian and permanent resident residing in Malaysia aged 19 to 65 on their next birthday with Occupation Class 1 or Class 2 only , must be in normal health and free from any physical deformity. This type of insurance is suitable if you're employed or self-employed and want to protect your earnings or if you want to have additional financial protection in the event of an accident. Legal foreign worker with occupation class 1 & 2 are eligible to participate this scheme as well. Coverage are within Malaysia jurisdiction only. Professional Cash Carriers, Divers, Racing Drivers, Jockeys, Aircraft Testers, Pilots or Crews, Stevedores, Explosive handlers, Engaged in demolition of building, Underground tunneling and Mining, War Correspondents, Sawyers, Oil Rig Workers, Timber Logging Workers, Firemen, Seamen and Sea Fishermen, Woodworking Machinist, Persons in Martial Arts, Boxers and Wrestlers, Person engaged in Ambulance Service, Steeplejacks, Policemen or Army/Military Officers or Low enforcement officers (except for involve in administrative works). 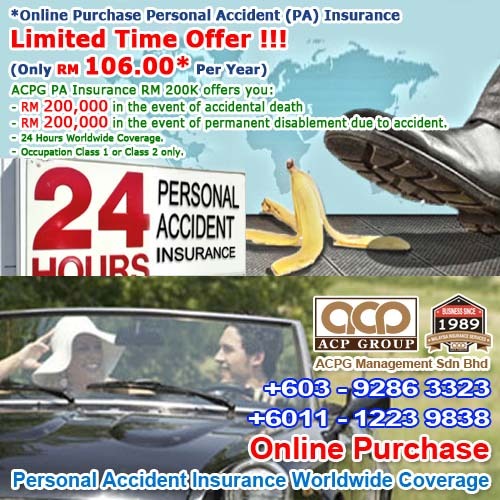 This insurance Scheme is available to Malaysian and permanent resident residing in Malaysia with Occupation Class 1 or Class 2 only must be in normal health and free from any physical deformity. Premiums are not refundable in the event you cancel your policy. on by alcohol or drug unless the drug is taken under the direction of a legally qualified medical practitioner provided such direction is not for the treatment or drug addiction. Provoked murders or assault, intentional self-injury, suicide or attempted suicide or any attempt thereat while sane or insane. Any preplan act by the Person Covered or any parties for the purpose of getting the benefits payout. Pre-existing physical defect, physical deformity in any way such as limping or require walking or hearing aids that existed prior to the inception of this Master Certificate and any further injury to the pre-existing physical defect or deformity. Deliberate exposure to exceptional danger (except in an attempt to save human life). AIDS Related Complex (ARC) however caused and/or any mutant derivatives, variations or treatment thereof however caused. Direct participation in riot or civil commotion, invasion, acts of foreign enemies, hostilities (whether war e declared or not) rebellion, revolution, insurrection or military or usurped power. War, civil war – whether declared or not. The Insurer Operator shall not be liable for accidental death and disablement arising from the Person's Covered employment if the Person Covered is directly or indirectly involved in any of the occupations/duties mentioned hereunder. However, benefits under this Takaful shall be payable where accidental death and disablement arises from normal private and social activities outside the scope of the Person's Covered employment. Excluded occupations : Professional Cash Carriers, Divers, Racing Drivers, Jockeys, Aircraft Testers, Pilots or Crews, Stevedores, Explosive handlers, Engaged in demolition of building, Underground tunneling and Mining, War Correspondents, Sawyers, Oil Rig Workers, Timber Logging Workers, Firemen, Seamen and Sea Fishermen, Woodworking Machinist, Persons in Martial Arts, Boxers and Wrestlers, Person engaged in Ambulance Service, Steeplejacks, Policemen or Army/Military Officers or Low enforcement officers (except for involve in administrative works). For clearer understanding, we suggest that you read carefully the terms and conditions in the ACPG Principal Insurer Personal Accident Master Certificate and Certificate Document.